This is a healthy and fragrant dish, just delicious for grilling in the summer and serving with salad or on slider buns with hummus. Puree the onion until the spices are well integrated - you may need to grind the cardamom pods before adding to the onion mix. Pull a small ball of meat out of the mixture and roll with your hands, then play "patty cake" and toss the meat slightly between your hands. This ensures a firmer and consistent shape. 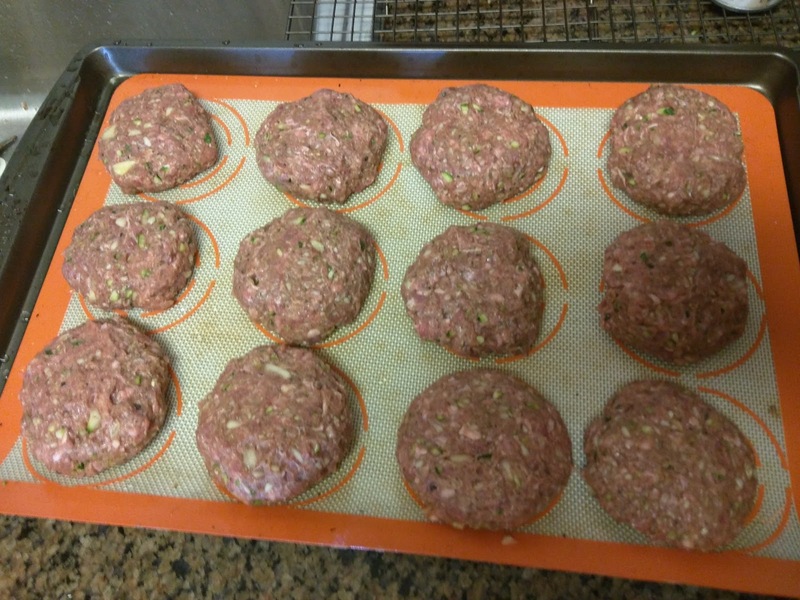 For sliders form into burger patty shapes or for kofta kebab roll into a small cylinder and thread onto a kebab. 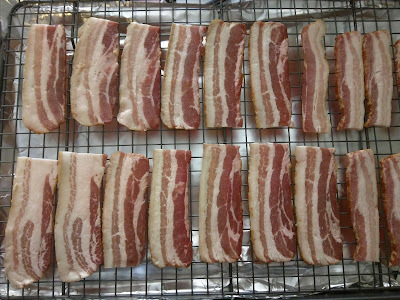 This is a great dish to prepare in large batches. Anything you are not eating immediately can be covered in plastic and moved to the freezer. Once frozen remove the kofta from the tray and store in an airtight plastic bag or container. 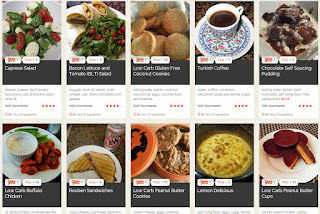 Yummly allows you to save and share recipes and find plenty of new content. 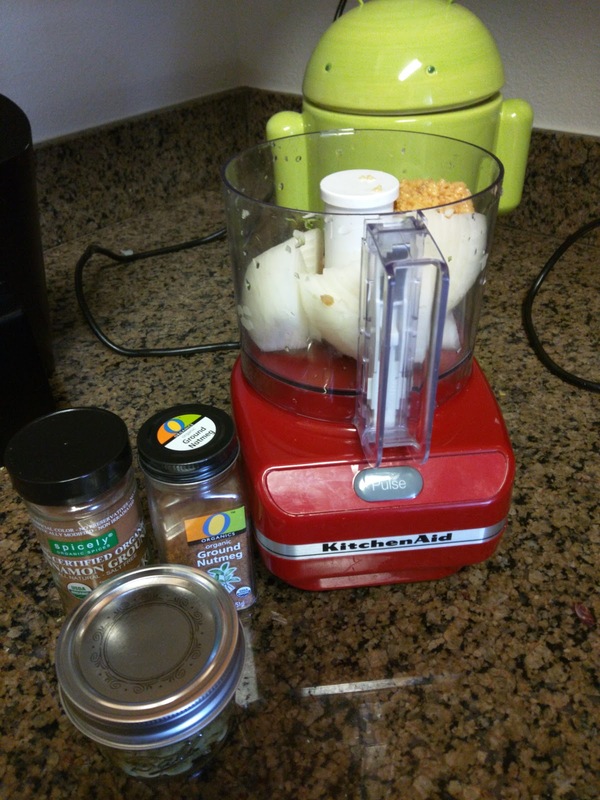 You can search by ingredients and they have a "paleo" option to turn up low carb recipes. 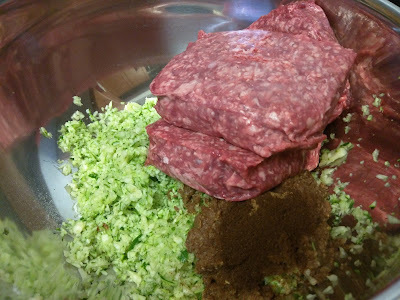 You'll find the Yum button at the bottom of each blog entry, click the "Yum" button to add it to your Recipe box or you can go to the Goth Gourmande Yummly page to see all my tasty recipes in one place. Why not try it out? There's nothing quite like dinner and a movie for a date right? The Landmark at Embarcadero is one of my favourite cinemas in San Francisco, all documentaries and indie films and reminiscent of the Dendy in Australia. I'm always on the look out for good food nearby little theatres like this and so we stumbled upon Stone housed in a small back building near the tourist district of San Francisco. 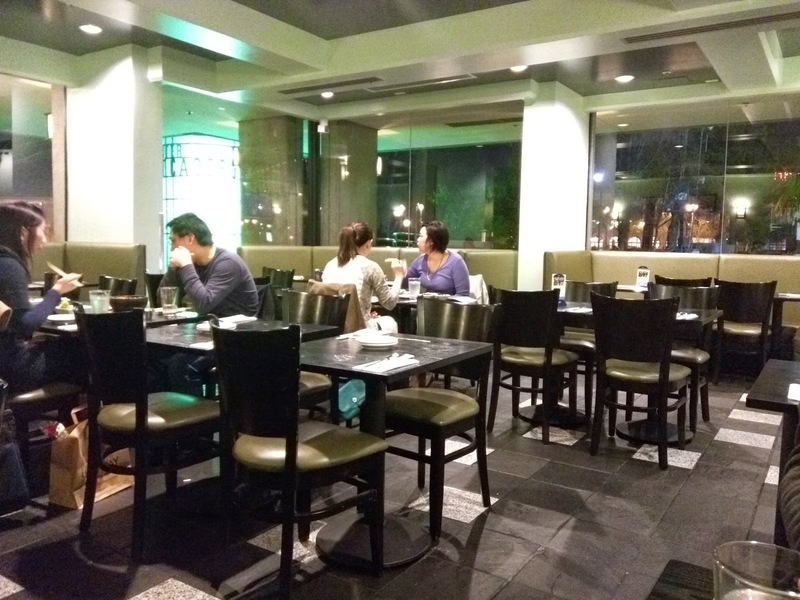 Like many business dristricts this area is quiet at night but the restaurant has mostly Korean diners and is packed by the time we're served dinner so this is always a good sign. 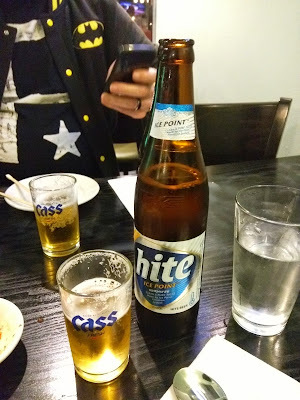 Korean alcohol like Cass & Hite beer are available. 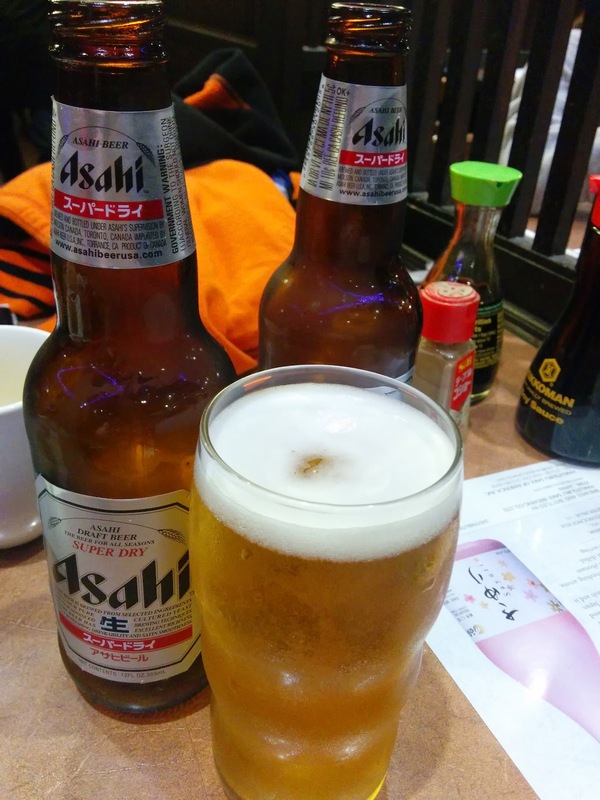 Most Korean beer is very light in flavour and designed to be drunk ice cold with steaming hot spicy food. Small plates of pickles, vegetables and small fish are provided before the meal and refills are available. 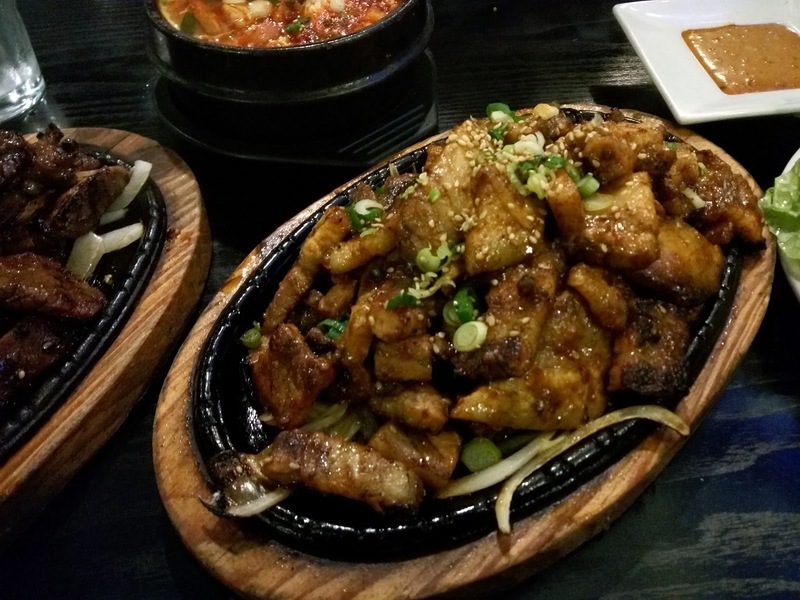 A healthy serving of pork belly is marinated in gochujang chilli and vegetables. This isn't the best spicy pork I've ever had as the fat hasn't been rendered enough out of the pork. I'd skip this and get more beef or a bipimbap bowl. 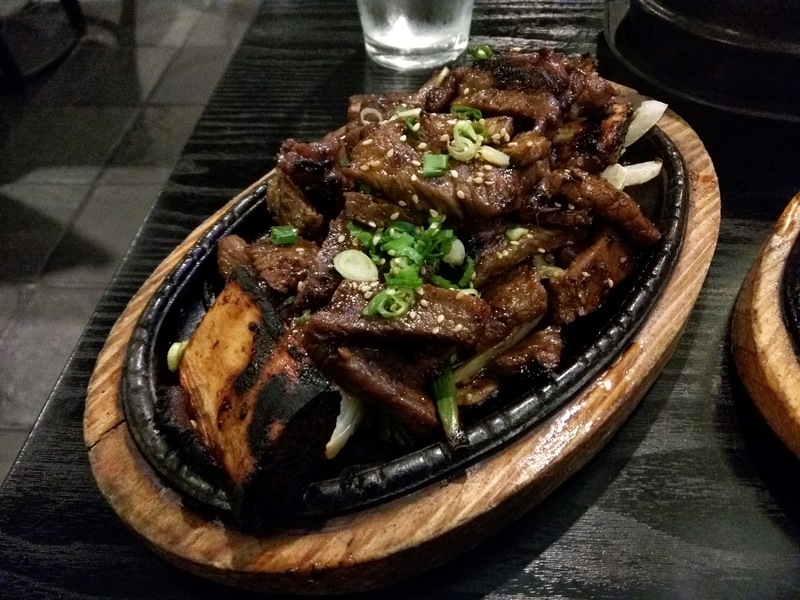 Beef short ribs are cut across the bone and marinated in a sweet soy and sesame dressing then grilled hot with brown onions. I prefer it when they leave the meat strips along the rib ready to be rolled out, but you can't have it all this is still a solid redition. 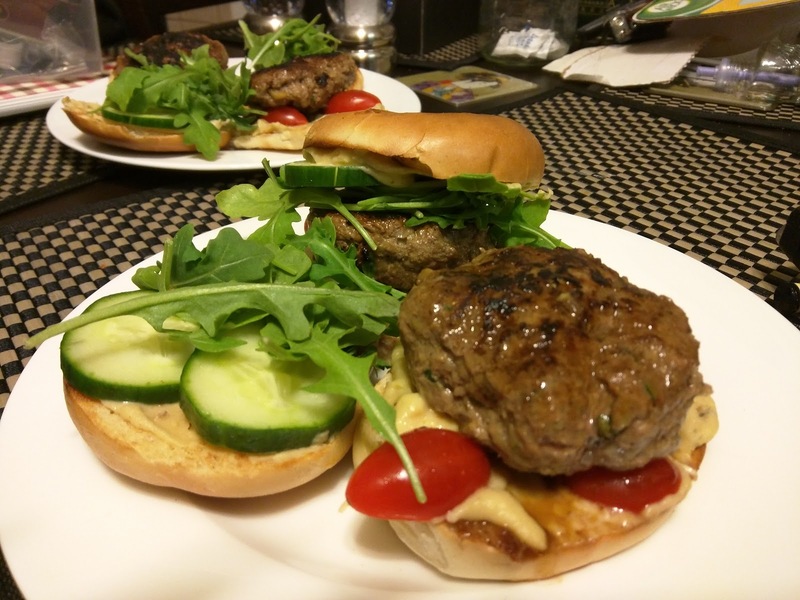 The meat quality is fairly good and the marinade is not overpowering. If you're going to get barbecue I definitely recommend this as the way to go. Two barbecue proteins with lettuce wraps, chilli, miso, sesame oil and salts and a serving of bowl of tofu kimchi stew. Ssam means "to wrap" and this is how you should eat Korean barbecue, take a piece of lettuce then spread with some chilli and/or miso. 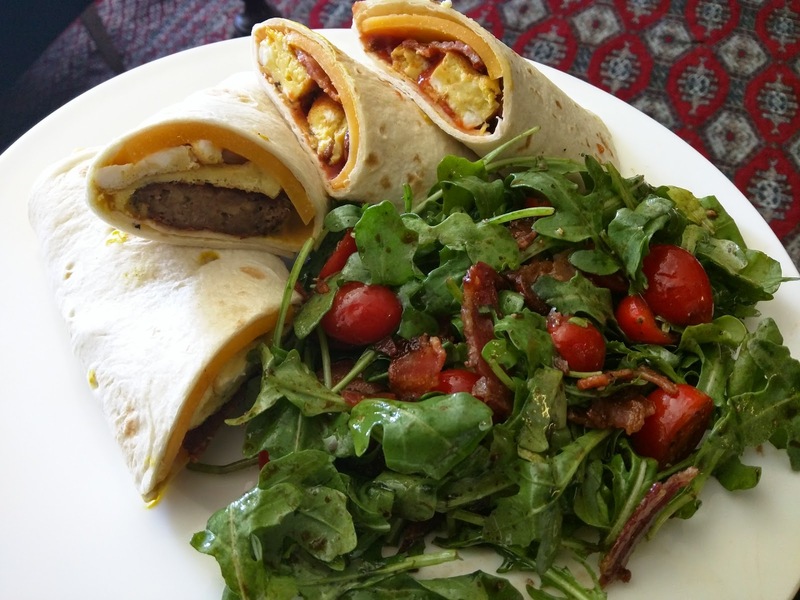 Top with hot vegetables and meat and then wrap the lettuce and eat whole like a taco. Delicious! In Japan this kind of food is known as yoshoku but I don't know the Korean name for it - essentially it is "Western Food" but it is generally unrecognisable outside Asia. Gratin is a common form of yoshoku and corn served with mayonnaise and cheese is a fairly common side dish or topping. It's delicious though and a good accompaniment to all the meat. Soon doobu - soft tofu stew - is one of my all time favourite dishes. 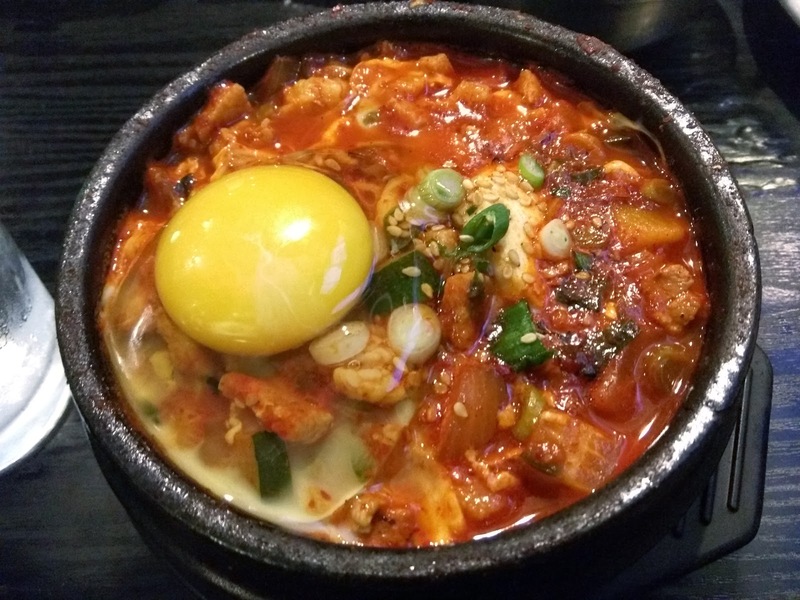 Soft fresh silken tofu is cooked with vegetables and meat in a tomato, malt and chilli stew and topped with a raw egg. Served in a sizzling hot pot the egg cooks in the steaming stew. This is a very good rendition rich and spicy but not overpowering. Various levels of hotness are available, this dish comes default with seafood but we request it vegetarian. 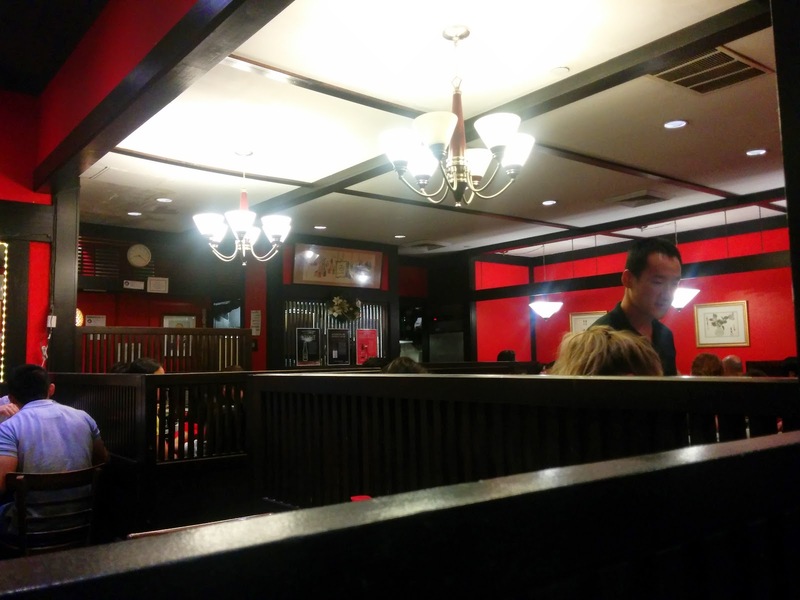 The service is fairly quick and the food is decent but not amazing. 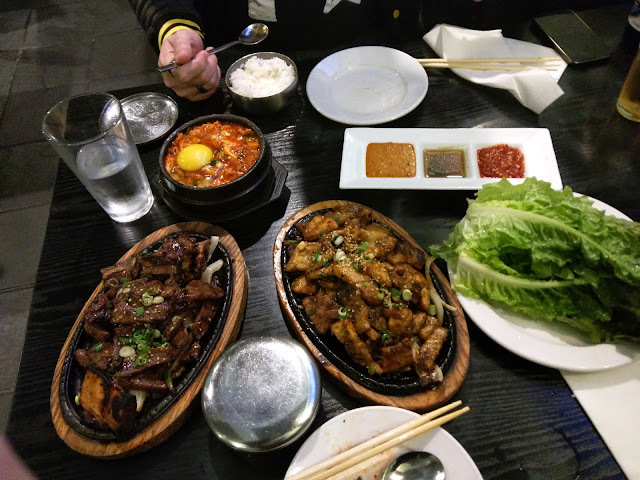 The Korean food in Japantown is definitely better quality but the soon doobu is excellent and I intend to return for some of their other homelier dishes rather than barbecue. They have various options of dolsot bipimbap - sizzling rice topped with meat, egg and vegetables that beg a return. I come from a Basque family so going to a restaurant like this means competing with my grandmother's cooking, and that's dangerous. San Francisco has a surprisingly large Basque community including multiple Basque restaurants and a cultural centre, so I'm hopeful when I book dinner with friends. 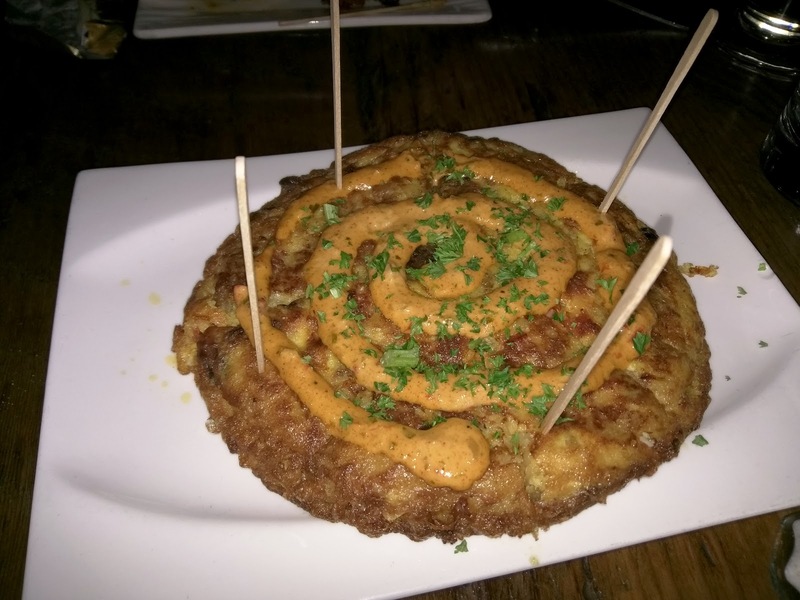 The Lauburu (Basque cross) is on just about everything, which is a sure sign that the staff and owners are actually Basque. I have a lauburu tattoo which quickly draws attention from our waiter and he asks about where my family is from. 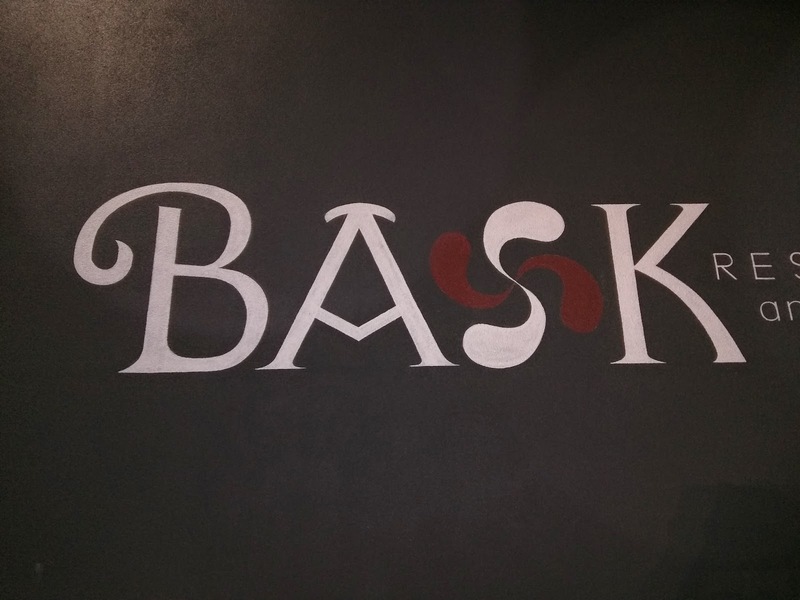 It turns out the chef at Bask is from Eibar in Gipuzkoa - the same home town as my family - and the food is consequently authentic and familiar. There are larger 'main' dishes on the menu but I think of pintxos as the ultimate Basque food, and since I'm catching up with friends from Australia some drinks and a variety of small plates is about perfect. 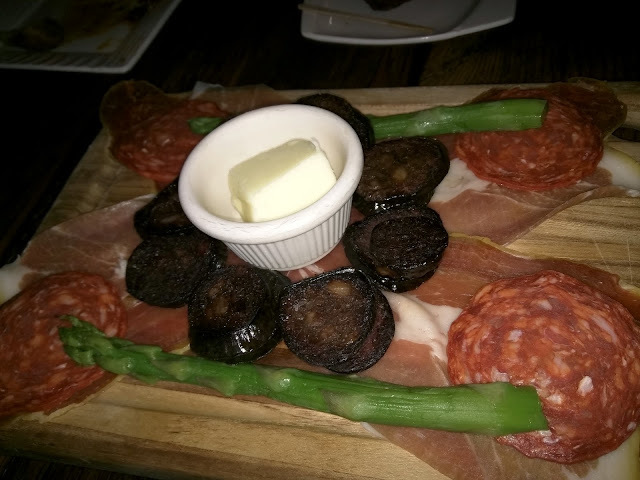 Serrano ham, chorizo and blood sausage are served with lots of bread. Every meal with my family would start with chorizo and bread so this is a must for me. This is chorizo as I remember it - hard cut spicey cured paprika sausage not the soft fresh sausage mince style that is common in Californian Mexican cooking. Covered with pistachio and honey served over sultanas and caramelised onions then baked until warm and gooey. 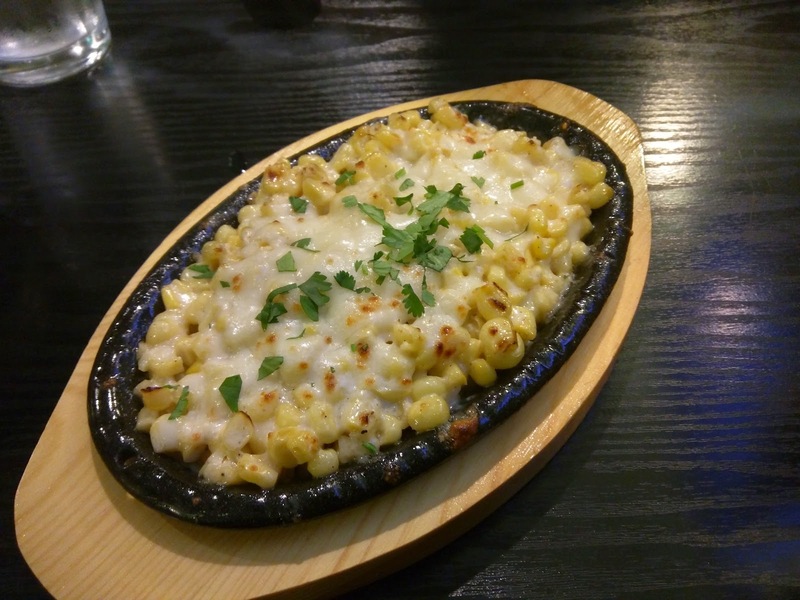 Perfect for sharing if you can fight your other diners for the dish. The tart goat cheese is offset by the sweet honey and crunchy nuts making this a perfect multi taste multi texture dish. 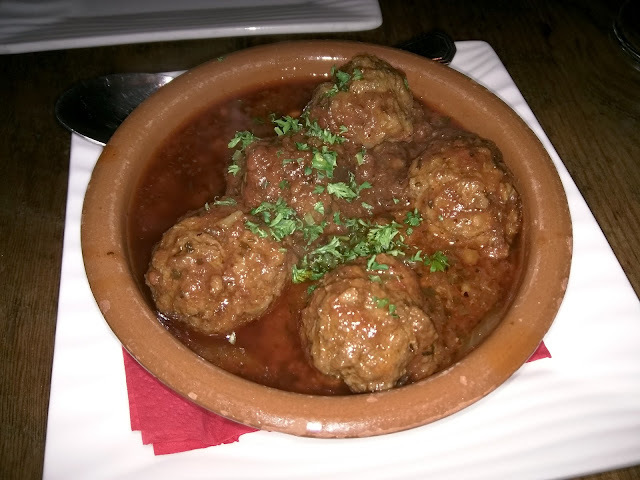 Basque style meatballs served in tomato sauce. Meatballs might seem simple but they call out to childhood nostalgia for just about everyone. Unlike American meatballs most European meatballs are made with multiple types of meat - in this case Lamb and Beef. I'm glad for the additional flavour profile since Lamb is not that common here in San Francisco. The sauce is very traditional and worth scooping up with the bread. 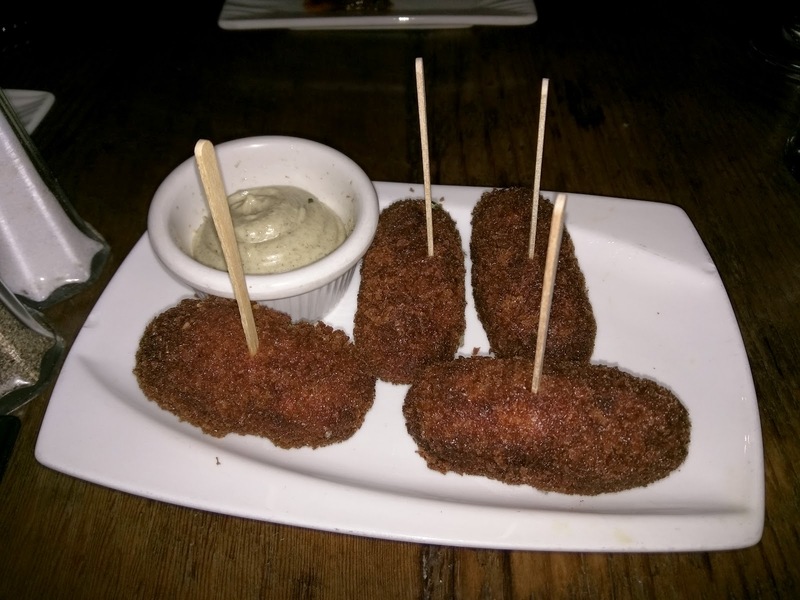 Another childhood favourite croquetas in many forms are common throughout Spain. These are a traditional ham croquettes with an egg and roux based soft and salty filling. Perfect drinking food. Not for the dieter this is rich beyond compare. Chunks of brie are covered in breading and then deep fried, served with a sweet jam. When people in California talk about tortillas they mean the thin corn or wheat bread products, but this egg and potato frittata is what the Spanish mean. Thinly sliced onion and potato is mixed with egg and fried in a pan then sliced into portions. This rendition is covered in more of the spicy aioli served with other dishes. 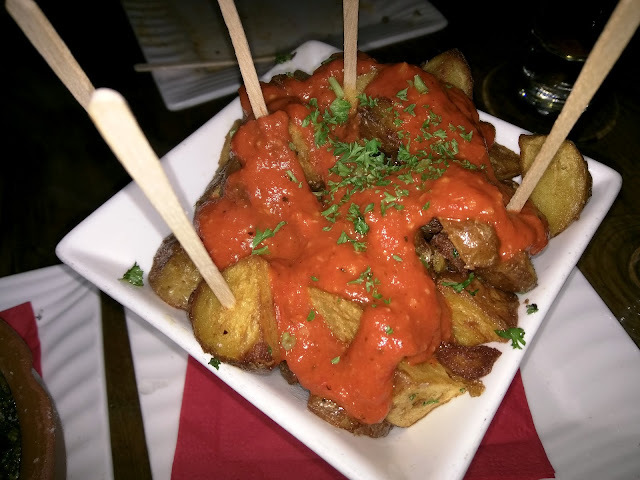 Another potato dish and a sure hit for the family - fried potates are served in a spicy tomato sauce. Great with cold beer or cider. All that rich food needs a few vegetables to cut through the fat. This is really a California style dish but goes well with the Basque food. 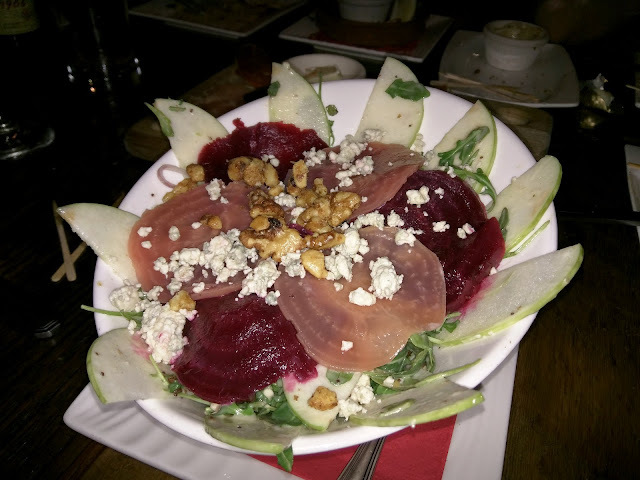 Arugula is dressed and toped with beets, blue cheese, walnuts and apple. 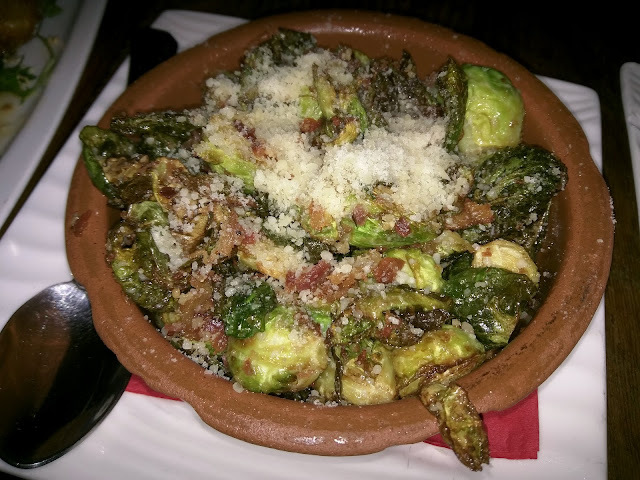 Brussel sprouts are one of those foods that I have discovered as an adult. Many people find that the savoury taste is only appealing as they age but for me these were decidedly absent in my house altogether - I am the only fan in my family! This is a great classic version fried with bacon and topped with parmesan cheese. The savoury taste is excellent with the meat dishes. Time for dessert for some of the diners! 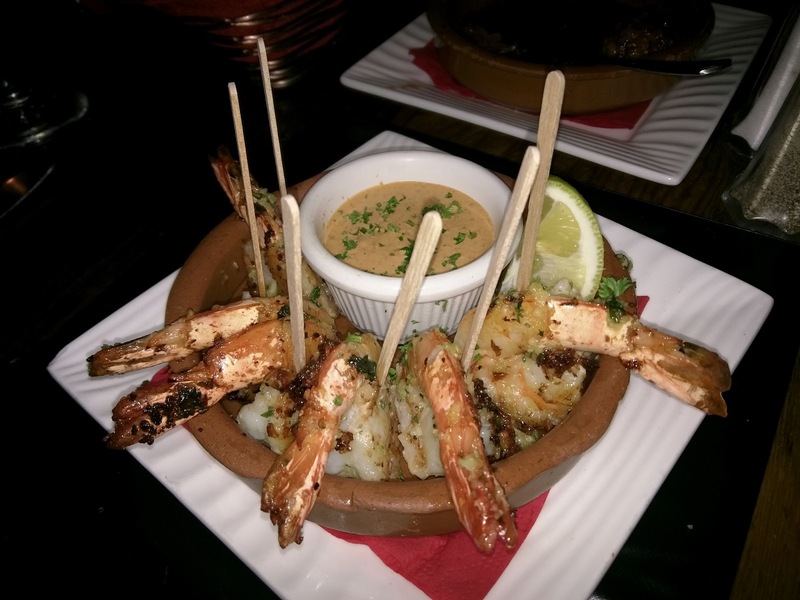 We opt for more traditional Spanish options. 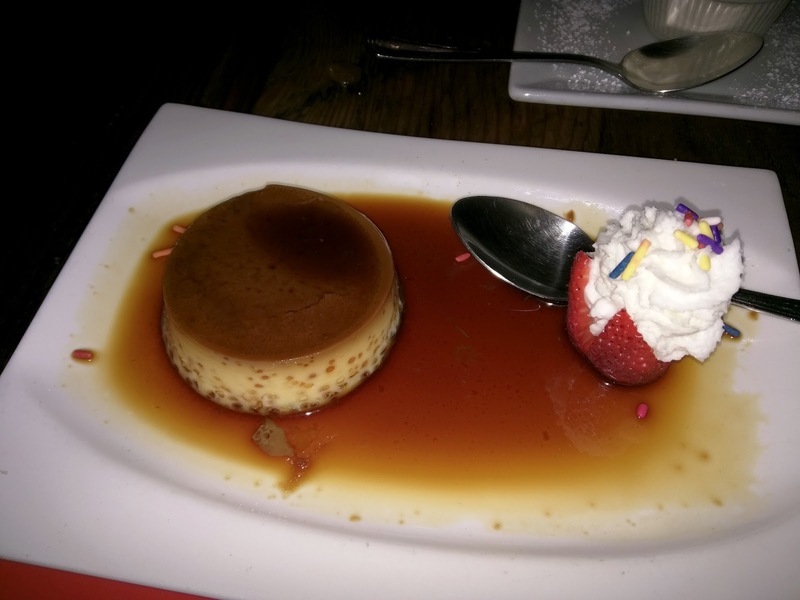 Flan is an egg custard baked with a toffee bottom that self sauces when turned out of the custard cup. This isn't the best flan I've had - you can see the air bubbles have not been well tapped out so that the custard isn't as smooth as I like. The taste is spot on though. 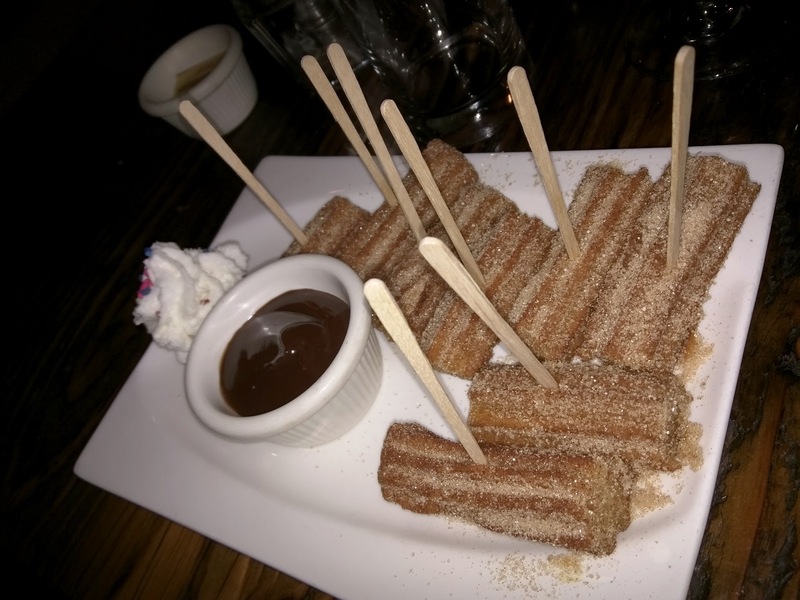 Churros are fairly common in California where there is a large Latin population but this is just how they should be served - covered in cinnamon sugar in small bites with a rich chocolate dipping sauce. If you can fit in more fried food after all those tasty tapas this is recommended and my partner looks like a kid in a candy shop as he wades in. My impression? 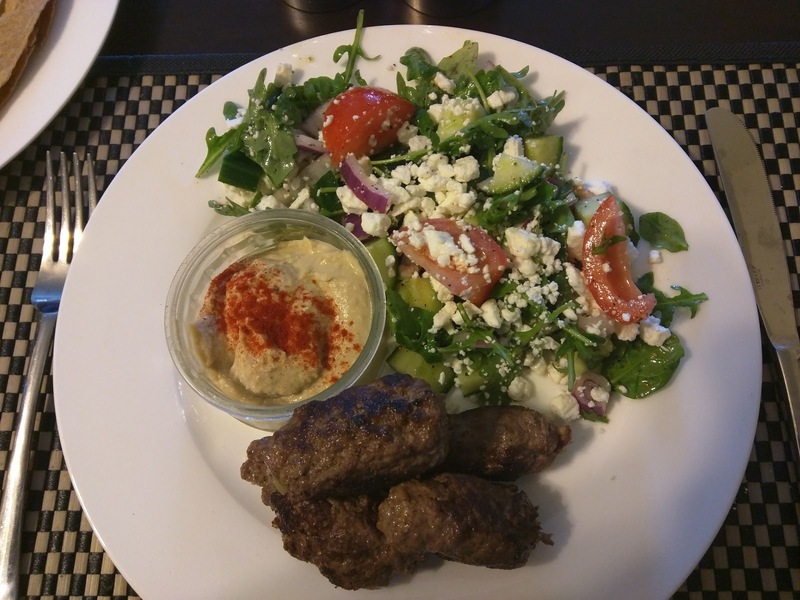 The food was very authentic and tasty, there is a huge range of small dishes that is sure to appeal to just about every diner including children and fussy eaters. There's a great range of wine, beer and cider available if you want to stay for a few drinks and small nibbles. Service was good though the restaurant was very busy on a Saturday night. Well worth a stop, I will definitely be taking family here when they visit. Of all the restaurants in Japantown in San Francisco Mifune is the one that feels most like a real family restaurant from Japan. 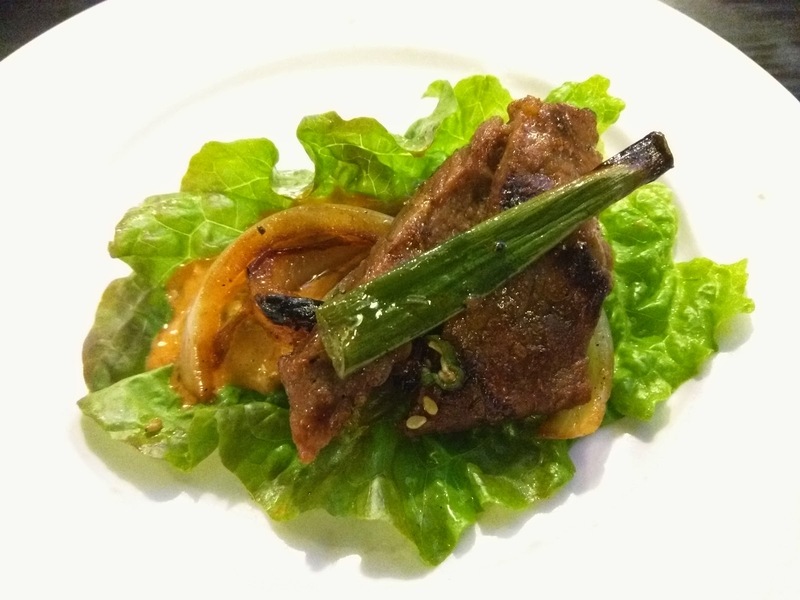 Specialising in family comfort food and good quality noodle dishes this is a great option for a casual date or a small group of friends looking for a drink and some down home Japanese cooking. Mifune is a semi regular restaurant option for us - whenever I'm eating carbs it's one of the first places I want to eat. 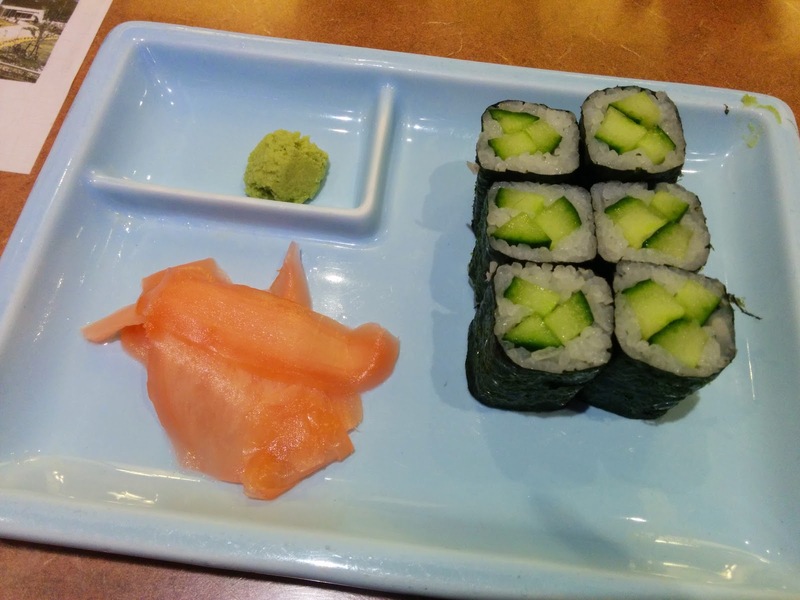 Mifune was listed in the 2007 Michelin Guide for San Francisco, long since knocked off the list by high end eateries brought by tech dollars but it is in my mind still worth a stop for visitors checking out Japantown. The decor is like something straight of a Japanese department store food hall bistro. Housed in the bottom of one of the Japantown mall buildings the restaurant is all dark wood, red paint and Japanese woodprints. Small fences provide privacy from other diners making dinner conversation relatively easy despite the restaurant generally being packed. Import Japanese alcohol is available for sale like Asahi, Saporo and Sake. Importantly this is not the Asahi brewed in Canada which is usually sold in stores in the US and tastes completely different. Served exactly as you might get them in Japan these crispy potato croquettes are filled with mash potato and covered in panko breadcrumbs. 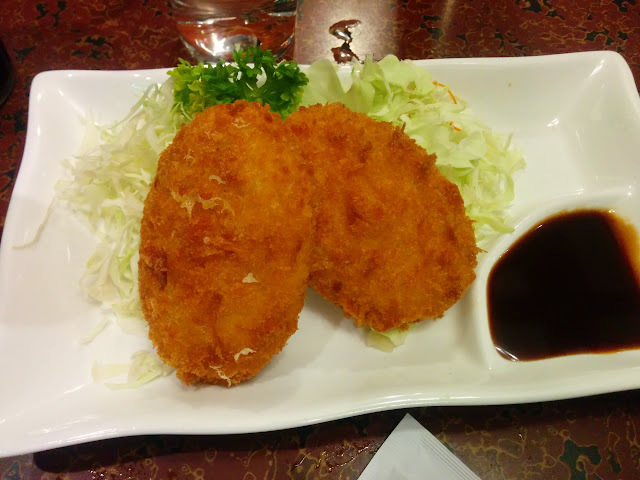 Served on a bed of cabbage with tonkatsu sauce - a sweet sticky BBQ sauce that goes well with meat and deep fried dishes. 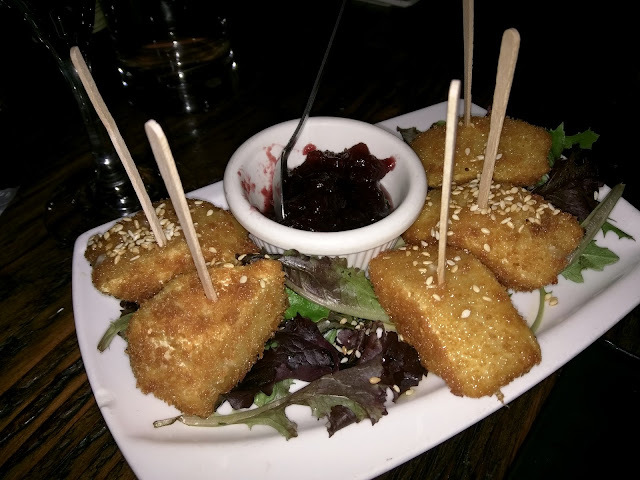 These croquettes are suspiciously uniform and look like they're made in a factory and possibly imported from Japan like most of the croquettes you can find in stores in Japantown. Don't let that put you off they're delicious and they go great with a cold beer or soda. Diced cucumber sushi appetiser is okay but not the best - mostly due to inferior sushi rice. My advice is stick to the noodle and fried comfort dishes. 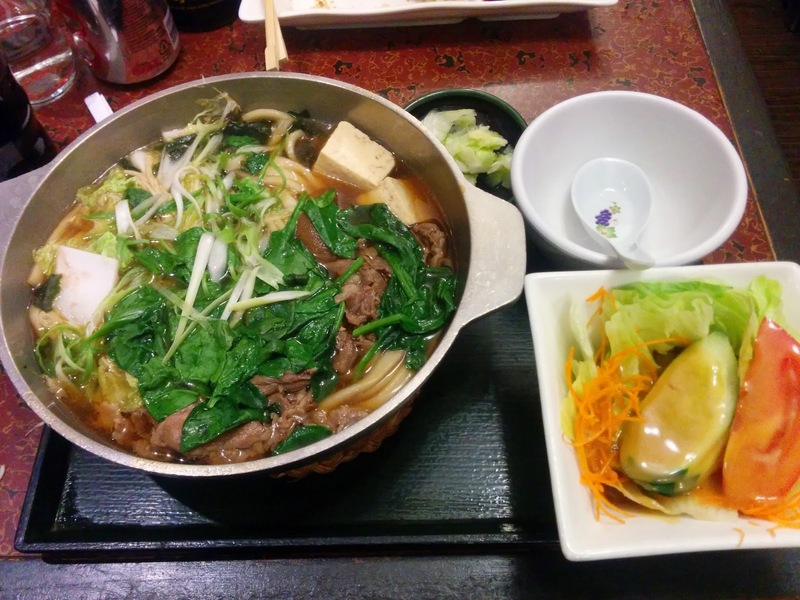 Nabe is a Japanese take on noodle hot pot, this dish comes with Udon, sukiyaki beef and lots of vegetables. A cold salad comes as a set. The beef is good and the Udon is excellent but I find the nabe soup very thin, there are better dishes on the menu. I have a similar complaint with the ramen at Mifune, despite their excellent trade in noodles the broths are too thin to bother with. Chewy delicious hand made soba noodles are served topped with a beef and vegetable Japanese style curry with pickled vegetables and egg. This is a very hearty dish and more than a bit messy, definitely one to eat on your own or with friends rather than a date you're trying to impress. 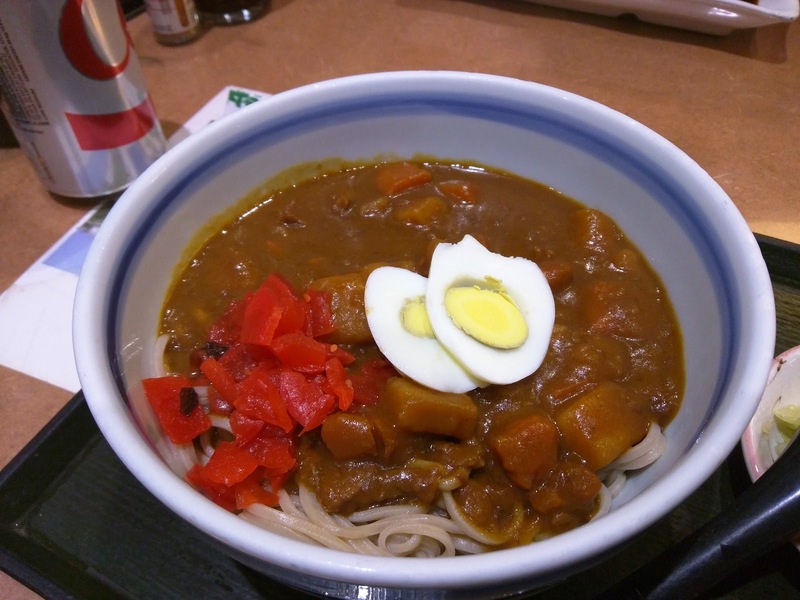 That being said good quality noodles and thick moorish Japanese curry is a hard combination to beat. Don't expect anything ground breaking in the curry - this is very similar to boxed House curry but it has that delicious comfort food appeal. This dish can also be served with Udon noodles for the same price. 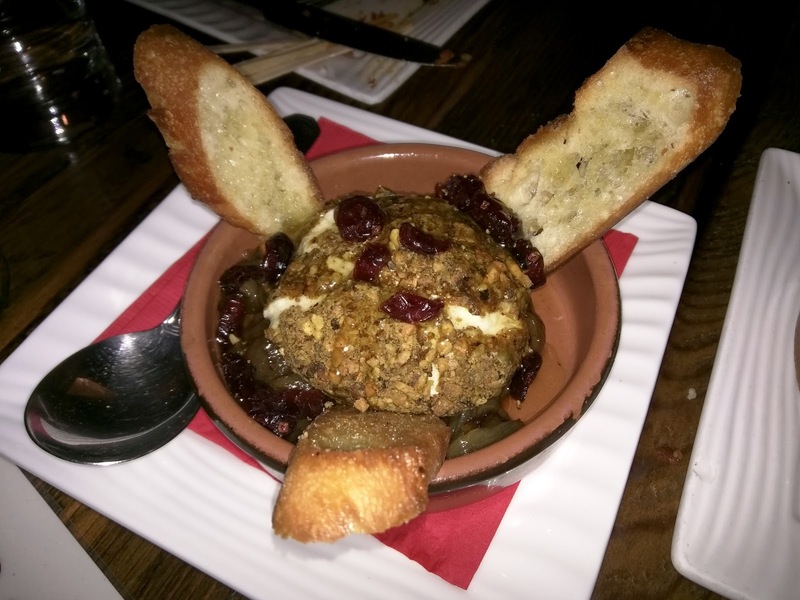 This is not an easy dish to find in the US and definitely one of my favourites to order from Mifune. 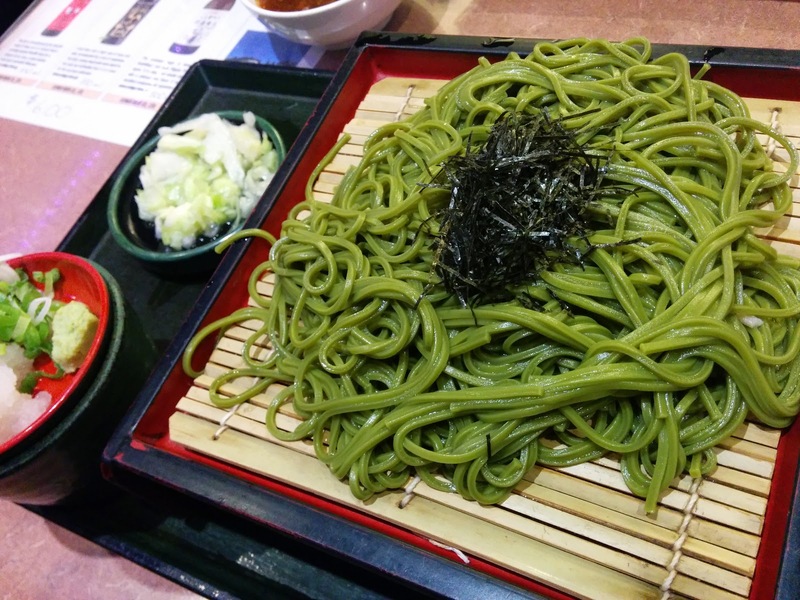 Buckwheat noodles are made with green tea, oiled and served cold with toppings like scallion, shaved daikon and seaweed. The noodles are chewy and pungent with tea, the dish is very simple but very filling and makes a great option for those looking for plain food. For the gluten free diners it's worth noting that buckwheat is not actually wheat and therefore this is a gluten free option. 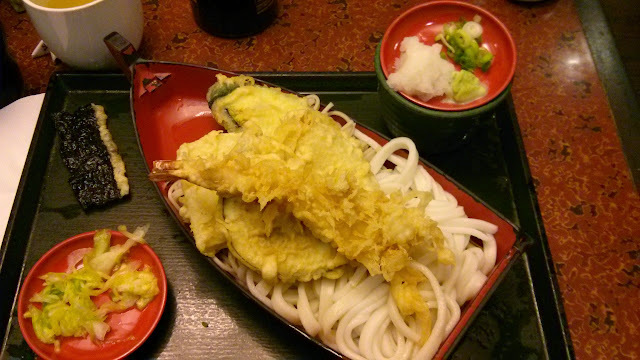 Thick chewy wheat udon noodles are oiled and served cold in a boat covered in tempura vegetables and prawn with a soy dipping sauce and toppings. 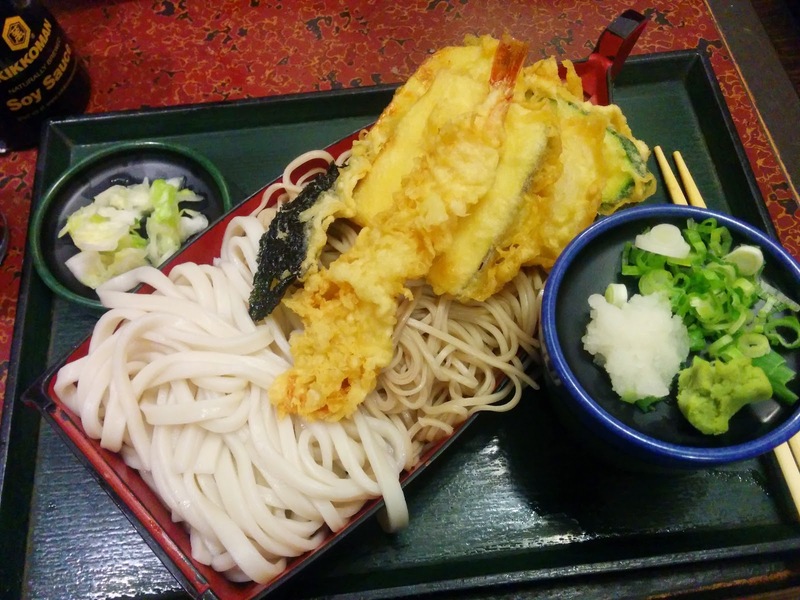 The Udon is good if you like that texture but pales in comparison to the soba. This dish is very similar to the tenzaru udon - a half serve of Udon / Soba noodles is topped with vegetable and prawn tempura. A soy dipping sauce is provided for the noodles, mix the wasabi and vegetables into the dipping sauce to your taste. I recommend all the wasabi. This is a great one plate option of all the best of Mifune and at a very reasonable price making it a great option for a mid week meal or pre movie munch. If you order Tempura on it's own without noodles you will receive a large mixed plate that is more than enough as a meal on its own. A range of vegetables like broccoli, pumpkin, onion, sweet potato, capsicum are provided. 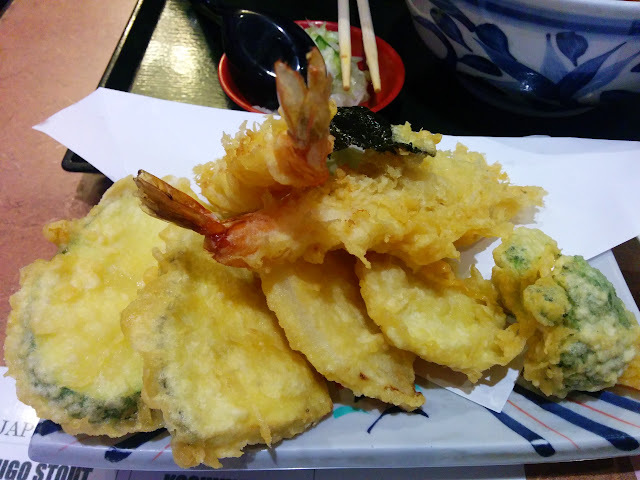 Two huge Japanese sweet shrimp (ebi) , a piece of fish and a crispy fried seaweed cracker are also usually included. Actual inclusions vary week to week and seem to be seasonal. For six dollars this is a steal, the batter is always light and the oil fresh. This set meal really shows the Japanese chefs having adapted to the US market and providing more food than any one person can possibly eat. 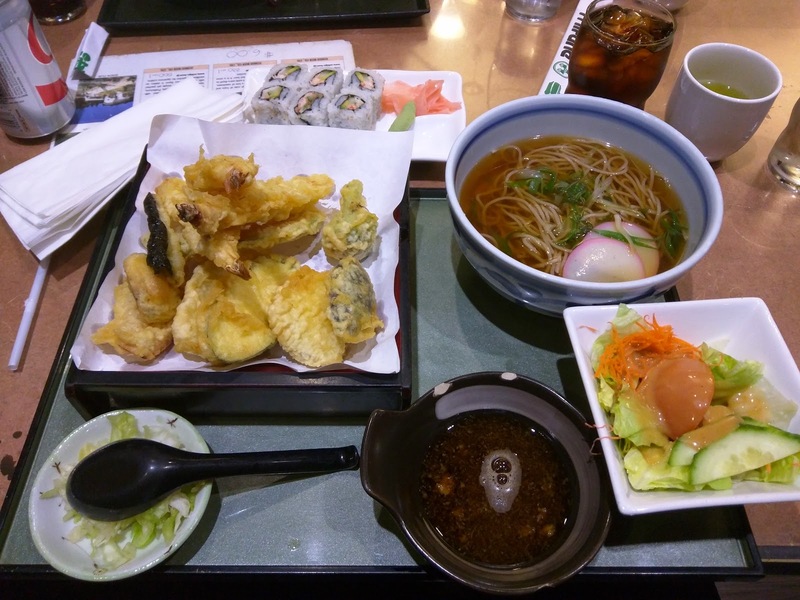 There are several other set meal options but this one includes a California roll, salad, full plate of tempura and a hot soy soba noodle dish with fish cakes and tea. All of the food is good quality but there really is too much of it and I eat half of most items and then look sadly at the rest. Because of the nature of the noodles and fried batter this is not a dish worth taking home for leftovers. If you are going to order a set meal at Mifune I suggest splitting it with a friend. Mifune is usually packed to the gills on the weekend, particularly if there is an event on in Japantown. No reservations are taken and a polite but firm queue is formed of hungry diners waiting for a table. If you're starving or have impatient family this might not be a great choice unless you come early or late. The key to their success is good quality simple food churned quickly. This means that you get efficient but possibly icy service. If you dawdle after finishing your meal the bill will be brought and your table cleared before you can say "should we stay for another beer?" My advice is after eating retire to another venue for drinks and conversation. Mifune have two other restaurants in Japantown - Mifune Don is a casual diner serving rice bowls and Mifune Bistro is an upstairs option with lunch style dishes. 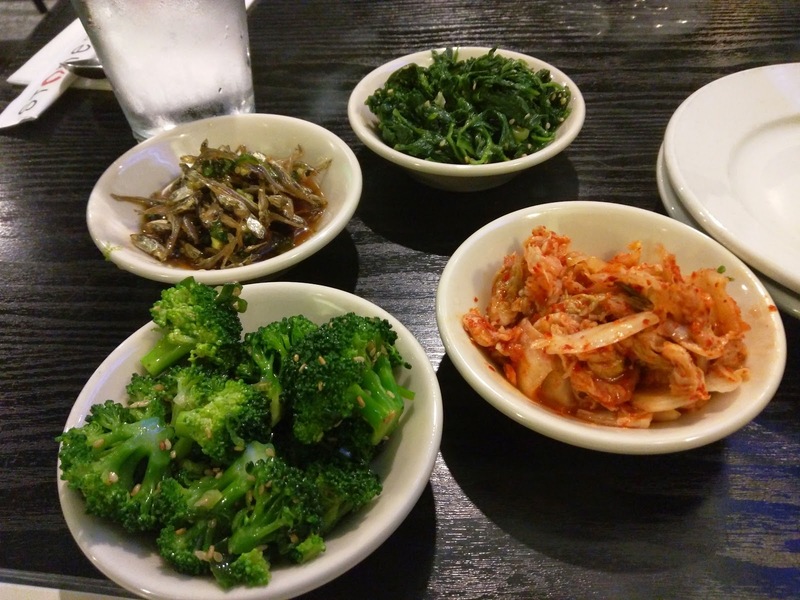 Skip these and head to the main restaurant next to Isobune. One of the best things in small towns is old fashioned sweet shops, or milk bars as I'd have called them. 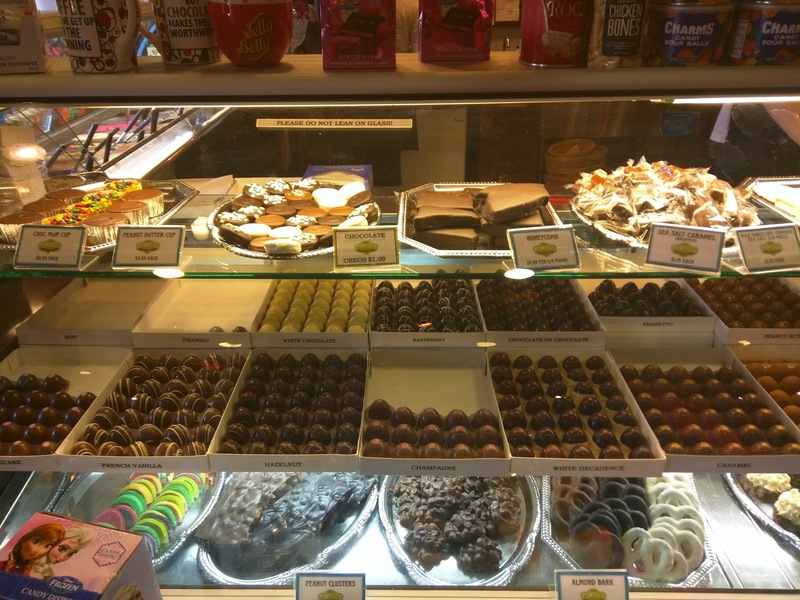 Powell's is a fantastic example in Sonoma which offers huge ranges of themed candy and gifts. Powell's have several locations around the Bay Area but since these days I only eat sugar on vacations it's best that I don't visit any of the others! Kids delight candies abounded everywhere like cheap chews, gum, lollipops and chocolate bars. Many old fashioned selections were available and an entire wall of jelly bean flavours. Big sections of themed sweets can be found like this explosion of pink. There were Hello Kitty, My Little Pony and romantic gifts a plenty. Super hero and less pinkified options also available. The chocolate cabinet included selections like hand filled chocolates, truffles and dipped confections like turtles, pretzels and toffees. We settled on some simple gelato cups with an included chocolate straw, great for sharing in the park opposite the sweet shop.